Adansonia Gregorii or, as it is more commonly known, the Australian Baobab tree can be easily identified by it's swollen trunk. They can be found in Kimberly and the Northern Territory and grow between five to fifteen metres tall. 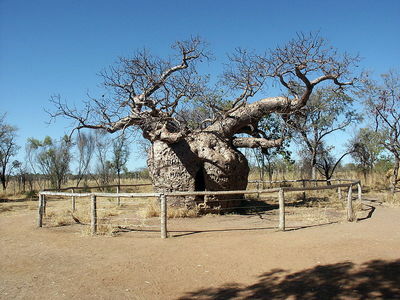 The tree contains large supply of water in its hollow trunk in order to withstand that hot, desert like conditions. The fruit has a white powder that can be used for medicinal purposes, as a thickening agent in gravies and jam, and a sweetener for drinks and sauces.